Miller & Zois has handled a significant number of wrongful death motorcycle accident cases in Maryland over the last 12 years. The grieving over the death of someone you loved dearly in a motorcycle accident is profound. It is particularly difficult for many survivors to question whether the death would have occurred if the other driver had just driven responsibly. This is the case in a motor vehicle crash death case too. The sense “it should not have happened” seems even stronger in bike accident cases. The last thing on the mind of many victims is the process of hiring a lawyer and bringing a wrongful death claim. But in these cases, you do want to move forward without having a seasoned Maryland motorcycle accident attorney, who will investigate the claim and preserve the evidence that needs to be preserved. Our attorneys are here to help guide you through your tragedy. Our attorneys will battle for you to get the compensation you deserve for your loss. Call us today at 800-553-8082 or get a free on-line consultation without any cost or obligation. Motorcycles are obviously very different than cars. 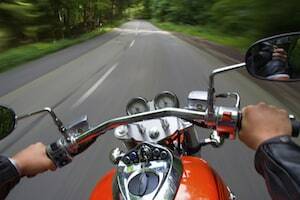 While most drivers enjoy the protection of four doors, a roof, a seatbelt, and airbags; motorcycle riders often have nothing more than a helmet and leather riding suit. Motorcycles are still involved in accidents, though, amplifying this lack of protection and making the resulting injuries far more traumatic than those suffered in standard car accidents. These traumatic injuries often result in death. Therefore, motorcyclists have to be increasingly vigilant in a world where distracted driving is slowly becoming the rule, not the exception. Motorcycles are less visible than cars as well. Think about it, when you check your mirror before changing lanes, you are looking for a car, so your brain may not even process that a motorcycle is actually in your blind spot. Although motorcyclists have to ride defensively, there is only so much that one can do to avoid an accident. Therefore, other drivers are often at fault for the serious injuries and fatalities suffered by motorcycle riders. There is a reason why your mom did not let you get a motorcycle when you turned 16, right? Although motorcycles represent only 2.5% of registered vehicles in Maryland, they are involved in 15% of all fatal accidents. Motorcyclists are four times more likely to be killed in a crash compared to an automobile, and 1 in 25 motorcycle accidents end in death. Luckily, motorcycle deaths are on the decline in Maryland; down 27% over the last 8 years. While some people think that motorcycle riders are reckless renegades, weaving through traffic, the statistics indicate that motorcyclists are not the sole cause of serious accidents. Specifically, in 42% percent of motorcycle crashes in Maryland, the other driver is at fault. And in 55% percent of rear-end accidents, the motorcyclist is blameless. Take these statistics with a few tablespoons of salt, too. Everyone has bias against motorcyclists, including the researchers who are determining fault in these studies. Moreover, if we did a study for “motorcyclists who are not driving like lunatics”, the statistics would look different. But by any measurement, a motorcyclist is just as likely to suffer serious injury or death at the hands of an others negligence compared to their own. Given these sobering stats for riders, the possibility of being involved in a fatal motorcycle accident is a real possibility. The costs associated with motorcycle accidents can be significant for family members and loved ones, with the biggest cost being the loss of a loved one. Luckily the law gives family members an avenue to seek the compensation that they are entitled to. Motorcycle fatalities, and even automobile accident fatalities, in general, are typically caused by avoidable situations. Distracted driving, drunk driving, speeding, can all result in accidents. However, when these situations happen to the motorcyclists, the results can be fatal. The following verdicts should give you a general idea of the value of a wrongful death motorcycle case. Of course, these are merely predictions because no one can specifically gauge how a jury will rule. 2013, Pennsylvania: $4,500,000 Settlement: After a night of drinking at the local bar, a man gets in his car and decides to drive home. During the trip home, he crosses the center line of a road and strikes a man on a motorcycle. The rider suffers severe injuries, and dies as a result. His family sues the owner of the bar, alleging that they should not have served the man who struck the rider. They specifically allege a violation of various liquor laws, which resulted in the rider’s death. The parties settled for $4,500,000 prior to trial. 2012, Maryland: $3,505,000 Verdict: A police officer spots a motorcycle allegedly racing a car. The police officer initiates a chase, but the rider refuses to stop. The officer then pursues the driver on to the interstate, continuing the chase outside of his jurisdiction. The police dispatcher even advised the officer to stop the chase. Still, the officer persists and rear-ends the bike as it attempts to exit the interstate. The rider dies from severe internal injuries, prompting his estate to sue for wrongful death. The police force denied gross negligence, but ultimately was responsible for a $3,505,000 verdict. 2011, Virginia: $25,000 Verdict: When pulling up to an intersection, a driver attempts to make a left turn. As he turns, he is suddenly and violently struck by a motorcycle rider. The rider dies almost immediately. His family then decides to sue the operator of the turning vehicle for wrongful death, alleging that the rider had the right of way. The driver contends that the rider was traveling around 80mph, and was ultimately responsible for the accident. The jury decides to award a verdict of $25,000. 2010: Maryland: $750,000: Our client, a young girl, not yet a teenager, lost her father when he was rear ended by a truck in Upper Marlboro, Maryland. The defense was the usual: speeding coupled with the fact that the man did not have a license to ride a motorcycle. This case settled in part, because the defendant had a relatively small insurance policy. It also settled quickly because the victim’s family wanted closure and we were able to get a very quick settlement. 2010, Pennsylvania: $1,600,900 Verdict: A 53 year-old man was riding his motorcycle when he saw a truck begin to make a left turn near an intersection in front of him. He applied his brakes, but his motorcycle skidded for nearly 40 feet. He could not stop before hitting the truck, and ultimately crashed into it, leading to severe blunt force trauma to the head and death. His wife sues the driver of the truck, as well as, the local government, alleging that the road was designed in such a way that would prevent drivers from being able to see approaching cars at the intersection in question. The jury found both parties liable for $1,600,900. 2009, Pennsylvania: $700,000 Settlement: A 24 year-old was riding his motorcycle when he suddenly strikes a low hanging utility wire. The collision causes him to fall from his bike and he suffers severe injuries to his head, which were fatal. His mother and father sue Verizon, the owner of the wires, alleging that their improper placement caused their son’s death. Before trial, the parties eventually settle for $700,000. The Maryland Wrongful Death Statute gives surviving family members the ability to sue those responsible for causing the accident. Further, it allows them to receive compensation to cover the expenses associated with a loved one’s death. While many attorneys are competent in handling wrongful death accident cases, not every attorney is skilled enough to handle a motorcycle fatality case. Everyone wants to blame the motorcyclist, no matter what the facts are. Most motorcycle riders are safe and vigilant drivers, something the attorneys at our firm recognize. We give the deceased the benefit of the doubt. Maryland law does too. Miller & Zois has significant skills and experience handling motorcycle cases. Your chances of recovering for damages is greater when hiring seasoned counsel who has a record of getting large verdicts and settlements. If a loved one or family member was involved in a motorcycle accident, call us at 800-553-8082 or visit our website for a free online consultation.